Looks like SquareEnix is aiming to hit critical mass with the Final Fantasy XIII franchise as the game has just been made available (for pre-order) on Steam following the company’s announcement at this year’s Tokyo Game Show. According to the announcement, all three of the game’s franchise will be available for PC sooner or later with XIII-2 and Lightning Returns releasing some time in the future. 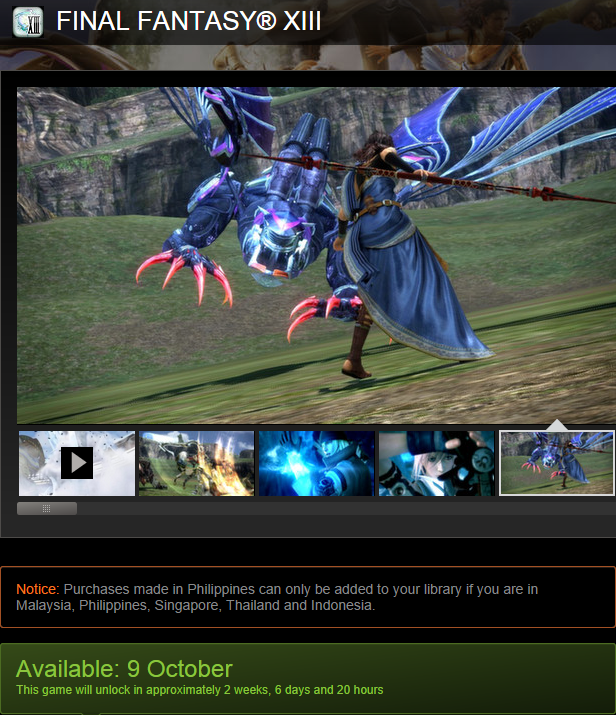 Currently Final Fantasy XIII is priced at $16 or P690.00 if you’re in the Philippines. SquareEnix is offering a special 10% discount to those who pre-order the game which will release on October 9.